So is a freshly caulked bathtub when it comes to resale. Caulk is one of the greatest tools for improving the appearance of your home. If you've ever iced a cake, you can handle a caulk gun. And believe me, caulking is more addictive than buttercream! Before you know it, you'll be scouring the property for just one more crack, nailhole, or chunk of missing grout. It also makes your daily cleaning easier. A fresh layer of caulk will fill in the tiny fissures that harbor mildew. The Natural Handyman has good directions and troubleshooting for first-timers. Have fun! Instant white and beautiful results--for only a couple of dollars, just my kind of project! 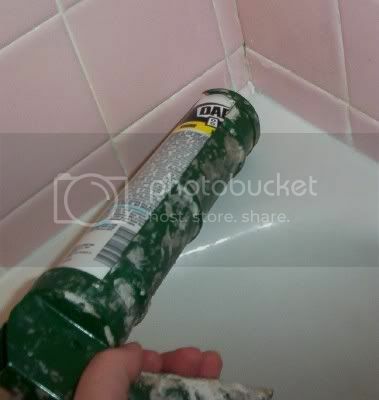 Hey - I just re-caulked our bathroom too! There's a crack in the tub that I'm in the process of fixing....but the shower looks so fresh and new I can't wait to be able to use it again! Do you take the old caulking off first? If so, how do you do that easily? Sarah, if you have an older home with layer-upon-layer of old caulk, that can look unsightly. The caulk should never protrude from the crack like a line of toothpaste. Instead, it should have a slightly convex shape so that the water runs down and off. If you need to remove the old caulk before applying new, I think they sell a tool just for that purpose. I think you could also use a utility knife or small chisel, too. The Natural Handyman link above has better tips for removing old caulk--different types of caulk call for different tools.